Flares burn at sunset in the Bakken oil and gas fields in North Dakota. High emissions findings undercut the case that gas offers substantial climate advantage over coal. "This study provides the best estimate to date on the climate impact of oil and gas activity in the United States," said co-author Jeff Peischl, a CIRES scientist working in NOAA ESRL's Chemical Sciences Division in Boulder, Colorado. "It's the culmination of 10 years of studies by scientists across the country, many of which were spearheaded by CIRES and NOAA." The assessment does suggest that repairing leaks and addressing other conditions that result in the accidental release of saleable methane could be effective. 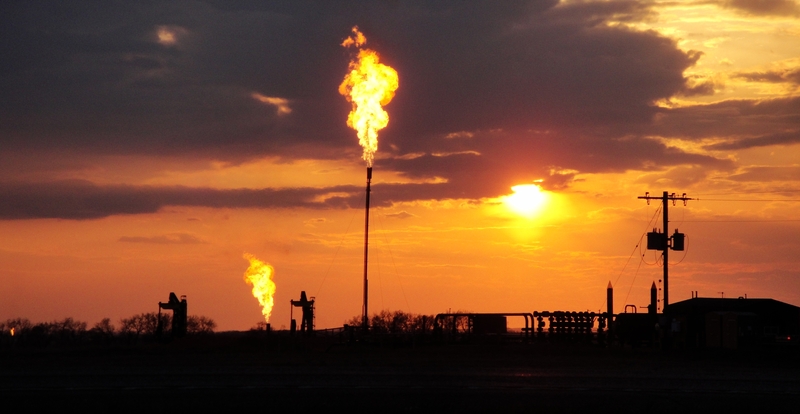 "Natural gas emissions can, in fact, be significantly reduced if properly monitored,” said co-author Colm Sweeney, an atmospheric scientist in NOAA ESRL's Global Monitoring Division. "Identifying the biggest leakers will substantially reduce emissions that we have measured." Alvarez, R.A., D. Zavala-Araiza, D.R. Lyon, D.T. Allen, Z.R. Barkley, A.R. Brandt, K.J. Davis, S.C. Herndon, D.J. Jacob, A. Karion, E.A. Kort, B.K. Lamb, T. Lauvaux, J.D. Maasakkers, A.J. Marchese, M. Omara, S.W. Pacala, J. Peischl, A.L. Robinson, P.B. Shepson, C. Sweeney, A. Townsend-Small, S.C. Wofsy, and S.P. Hamburg, Assessment of methane emissions from the U.S. oil and gas supply chain, Science, doi:10.1126/science.aar7204, 2018. Methane emissions from the U.S. oil and natural gas supply chain were estimated using ground-based, facility-scale measurements and validated with aircraft observations in areas accounting for ~30% of U.S. gas production. When scaled up nationally, our facility-based estimate of 2015 supply chain emissions is 13±2 Tg/y, equivalent to 2.3% of gross U.S. gas production. This value is ~60% higher than the U.S. EPA inventory estimate, likely because existing inventory methods miss emissions released during abnormal operating conditions. Methane emissions of this magnitude, per unit of natural gas consumed, produce radiative forcing over a 20-year time horizon comparable to the CO2 from natural gas combustion. Significant emission reductions are feasible through rapid detection of the root causes of high emissions and deployment of less failure-prone systems.